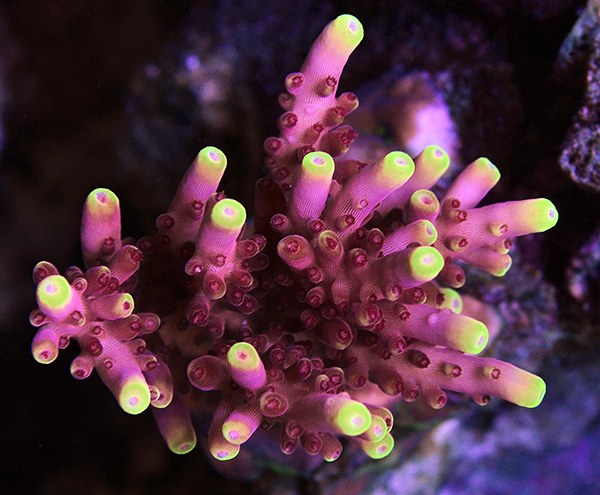 Unidentified Acropora fragment growing in a US reef aquarium. Image: R. Goettel. Hint: It is a small, started Acropora sp. SPS coral that neither the owner nor the well-known coral culturist who sold him the frag has been able to identify with certainty. Look to the November/December 2018 Issue of CORAL for what other readers, as well as a panel of experts, think this species is and see a larger growing colony of the same coral. CORAL Cover, November/December 2019. Triangular Butterflyfish with background of Acropora humilis. Images by Gary Bell, Oceanwide Images, AU. Keeping Acropora corals is both the fondest dream and the most demanding challenge for most adventuresome reefkeepers. Look to the next CORAL for a Hands-On Acropora Primer by expert SPS culturist Than Thein, a roundup of the most coveted frags and secrets of some of the country’s top Acropora farmers and reef aquarists by Felicia McCaulley, a portrait of an outstanding German Acro-dominated reef system by Robert Haase, and much more. Unforgettable images of some of today’s most outstanding aquarium corals. 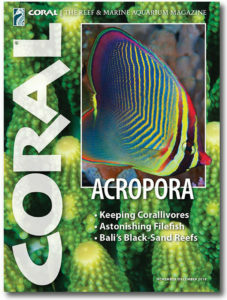 Look for CORAL’s Authoritative ACROPORA Guide — A sure Collector’s Issue! On sale November 6th. Arriving and in subscriber’s homes around November 1st.